Braising means to cook in liquid as a moist type of heat, this does not have to be all water as there are many varieties of braising recipes. This will normally be in a casserole style container that has a lid. 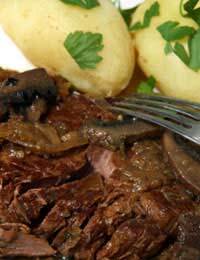 Braised steak makes an ideal dinner meal and is something that you can prepare and leave to cook slowly in the oven or slow cooker for many hours. The meat when served will fall apart as the slow cook has tenderised it to melt in the mouth. Add different flavourings and you have different recipes for the same basic meat ingredient. Braising is not only an easy way to cook beef but can also be used to provide tasty meals from the cheaper cuts of meat. When purchasing beef or steak for braising there is no need to buy the more expensive beef, look instead for beef skirt, stewing steak, chuck steak or shin of beef. Names of cuts can vary according to which part of the country you live in. If you are lucky enough to live near a butcher then he will advise you on the cuts of meat required for braising he may even spend time telling you how to cook the meat. But, do not be swayed into buying better cuts as they are more expensive and can be used for other recipes. Supermarkets may not always give the exact name for a cut of beef for braising but may put it under the title of braising steak or stewing steak. If you purchase shin beef with the bone still in keep the bone in the casserole whilst it is cooking as it will enhance the flavour. Whatever piece of beef you purchase for braising make sure that the pieces are cut into even pieces so that they cook through thoroughly and you are not left with a few larger lumps of meat that are too tough. Because of the longer cooking time you cook the piece of beef whole. You are aiming for a flavoursome tender casserole. Put the flour, salt and black pepper into a plastic bag and shake to mix. Cut the beef into even sized pieces and put them into the bag. Shake to coat each cube of beef. Heat the lard in a heavy based metal casserole dish and place in the pieces of beef. Cook so that they are slightly brown on all sides. This will seal in the flavour and the flour will help thicken and flavour the gravy. Add the onion at the same time and cook until clear. Mix the stock cube with enough water to cover the meat and add to the casserole dish with the bouquet garni. Bring almost to the boil, cover with lid and place in the oven at around 160 C or gas mark 3 and leave for at least three hours. Remove the bouquet garni and thicken if necessary with gravy granules. Serve with new potatoes and steamed seasonal vegetables. You could add sliced carrots or even chopped turnip when meat first goes into the oven. Half hour before service add button mushrooms and a portion of frozen peas for colour. Another option is to use half water and half red wine for an even more flavoursome meal. But what should you cook tomorrow? Why not try our Easy Chicken Casserole recipe or how about our delicious Spanish Casserole? When cooking a braised steak casserole in the oven or slow cooker, if it turns out that the meat is extremely tough, has it been cooked for too long a time or not enough time.I cooked a steak casserole in my slow cooker on a low setting for 6 hours and it was very tough.